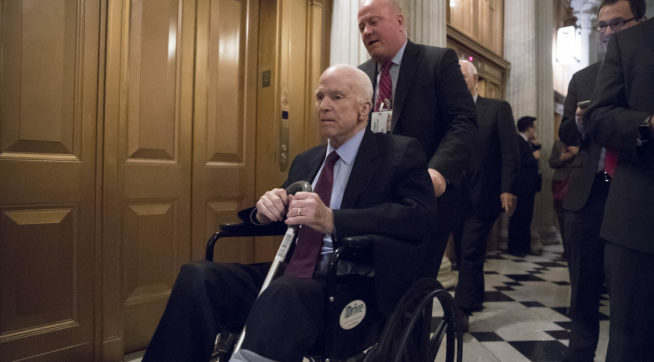 Sen. John McCain (R-AZ) said that he will support the Republican tax plan, The Hill reports. Said McCain: “After careful thought and consideration, I have decided to support the Senate tax reform bill. I believe this legislation, though far from perfect, would enhance American competitiveness, boost the economy, and provide long overdue tax relief for middle class families.” The text of the bill has not been released yet, so he has not read it. From the picture above, he is not long for this world. And he has decided to trash whatever goodwill he garnered from his No vote on Obamacare repeal with this. Goodbye Senator McCain. I don’t think you are going where you think you are going. Meanwhile, “Congress’ nonpartisan tax analysts have concluded the Senate Republicans’ tax plan would add $1 trillion to the deficit over 10 years, contradicting White House promises the bill would pay for itself and complicating GOP leaders’ efforts to find the support they need to pass the bill through a closely divided Senate,” the Washington Post reports. Sen. Susan Collins (R-ME) threw a little obstacle in the way when she demanded that Alexander-Murray, the Obamacare Exchange Stabilization bill, be passed and signed by Trump before senators take a final vote on a $1.5 trillion Donor Relief bill that would repeal Obamacare’s individual mandate, The Hill reports. A Republican plan to automatically trigger tax increases or spending cuts if revenue falls short has been shot down the U.S. Senate’s parliamentarian, the Washington Post reports. “The attack ads practically write themselves. If I were the campaign manager of a Democratic candidate running for Congress in 2018, I would be praying this bill passes. It is the kind of sprawling, inelegant transfer of the tax burden from multinational corporations and the idle rich to the middle class that about 80% of voters really, really won’t like. As a result, Democratic challengers can tailor-fit their attacks on Republican opponents depending on how they need to move the electorate. Want to depress Republican voter turnout? Just find a handful of Republican voters willing to go on camera and have them ask, “Congressman, why did you raise my taxes?” Want to mobilize older Americans and those worried about healthcare? Point out that your opponent cut Medicare so that Donald Trump’s kids can inherit billions of dollars tax-free. Want to project an image of personal and fiscal responsibility? Bemoan the trillions added to our debt so that multinational corporations can ship more jobs overseas. The possibilities are endless. Sen. Richard Durbin (D-IL) said he is encouraging his colleagues to join him in blocking spending legislation if the legal status of “dreamers” isn’t resolved, the Washington Postreports. Is Donald Trump delusional or a serial peddler of disinformation? A new poll from America First Policies, an outside group aligned with President Trump, finds Roy Moore (R) leading Doug Jones (D) by just one point in Alabama’s U.S. Senate race, 46% to 45%. What’s at Play in the 2018 Senate Races https://t.co/J3NjKsffRY? “Former Trump adviser and longtime political troublemaker Roger Stone has been asked repeatedly how he knew, seemingly in advance, that WikiLeaks was going to publish damaging information about Hillary Clinton’s campaign. And he has repeatedly refused to answer, saying he had a ‘go-between’ who did not wish to be named,” ABC News reports. Find the estimate of the cost of the tax bill to be wishful thinking if the Reagan and Bush eras are considered, a mere 1.5 trillion over ten years? More like per year. I also expect the effect on the economy will be negligible, although the Republicans will amplify any good news times a thousand (Walmart hires 20 in Portland!!!) and then claim “See? It’s working!” Yeah, right! And if you think the stock market will just continue to climb dream on, a major correction or crash is coming. And then there’s war, you know it’s coming, and so does every Republican in congress. Kate’s Law should be passed, Enough already!